New! 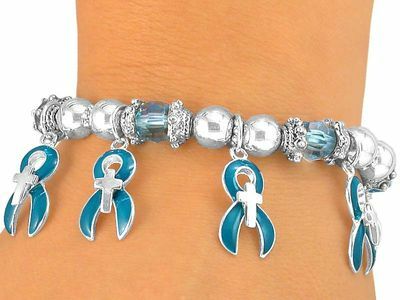 Silver Finish Stretch Bracelet©2005 Accented By Clear Faceted Teal Beads And Dangling Teal Ribbon Charms With Silver Tone Christian Crosses In The Center. Click On Picture For More Detail. Bracelet Measures 7 1/2" Long. Exclusively Ours! We Are The Only Manufacturer Of This Bracelet! Great For Fundraisers, Walks, Donation Gifts, Or To Show Support! A portion of the profits of the sale of this bracelet will be donated to Gilda's Club.